Eric Kim is co-founder and CEO of RushOrder, an L.A.-based mobile food ordering startup. Editor’s note: Eric Kim is co-founder and CEO of RushOrder, an L.A.-based mobile food ordering startup. To say that recent capital inflows in the food-ordering space have been growing rapidly wouldn’t be doing the current funding environment justice. In fact, it might even be considered a gross injustice akin to calling Mark Zuckerberg a mere website developer. While just $46 million and $25 million were invested in food ordering companies in 2013 and 2012, respectively, a staggering $600 million was invested in 2014. And so far this year, we’ve had approximately $360 million invested to date, which when annualized, comes out to approximately $1.2 billion1. That type of growth is not something you see too often. So, what’s driving investors to throw such large sums of money into this area hand over fist? Well, in light of how much coverage companies in this sector have been getting in the media lately, the answer may not be as clear and obvious due to all the noise out there. 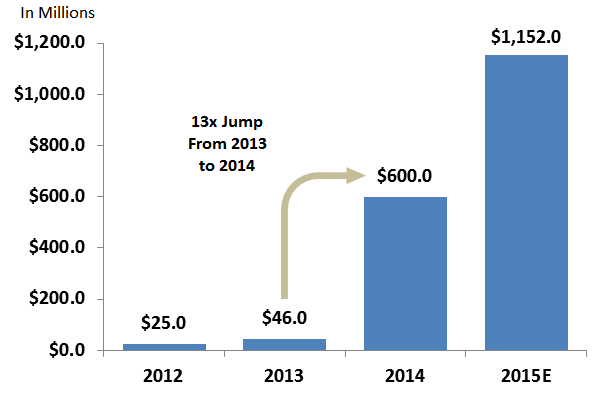 To the public’s detriment, the continuous barrage of headlines related to funding, M&A, etc. has swayed popular opinion such that one’s initial inclination is to assume that the competitive landscape is crowded, and that the market itself is accordingly saturated. Now, while the arena has indeed become highly competitive, the latter point on market saturation couldn’t be further from the truth. In fact, it is the under-penetration of this market that presents a massive opportunity commensurate with the level of risk being assumed by investors today. The first thing to note is that the takeout and delivery market is itself a whopping $70 billion market. 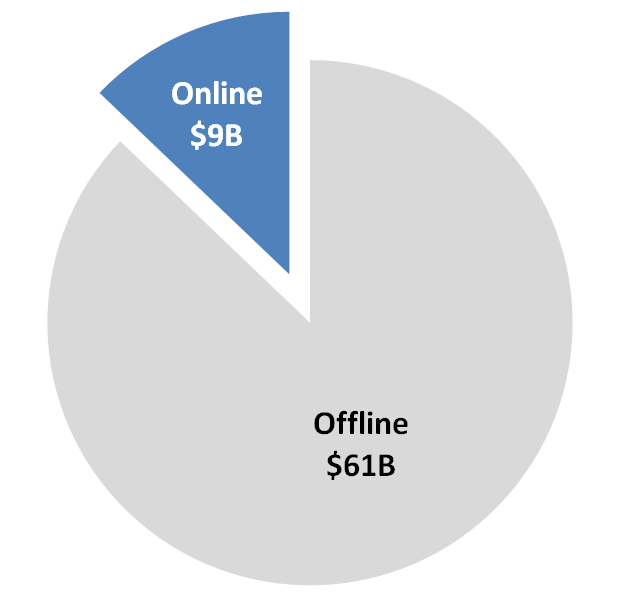 More importantly, of that $70 billion, only about $9 billion (roughly 13 percent) is online2. Thus, in a world where almost everything is done either on the computer or through mobile apps, approximately 9 out of 10 individuals are still using the traditional method of picking up the phone to call in takeout and delivery orders. Furthermore, back in February, Morgan Stanley/AlphaWise did some survey work that showed surprisingly low awareness levels among consumers of GrubHub — the largest and most recognized player in the space — and its services3. The results showed that approximately 55 percent of consumers in New York (their core market) had limited awareness of the GrubHub (and Seamless) service, and that percentage rises to 80 percent in markets outside of New York. Keep in mind that GrubHub has been around since 2004 (pre-Facebook). What this means is that the vast majority of consumers aren’t even aware that these types of services even exist. If you look to large chains like Domino’s and Papa John’s today, their online penetration rate is roughly 45-50 percent2. Seeing the exponential growth in order volumes reported by competitors, small and large, in the food ordering space, it’s clear that achieving similar penetration rates is not really a matter of if, but of when. We can also look to comparable metrics outside the U.S. for added insight. For example, the UK’s GrubHub equivalent, JustEat, has a market penetration rate of approximately 25 percent. And in South Korea, a country well-known for having a strong delivery ecosystem, Baedal Minjok, which is South Korea’s GrubHub equivalent, has a 75 percent market penetration rate2. The U.S., at a meager 13 percent, is only in the beginning stages of its own broad migration to online/mobile ordering. The direction we’re heading in is pretty clear, and industry experts tend to agree that online orders are expected to surpass offline orders sometime within the next decade. 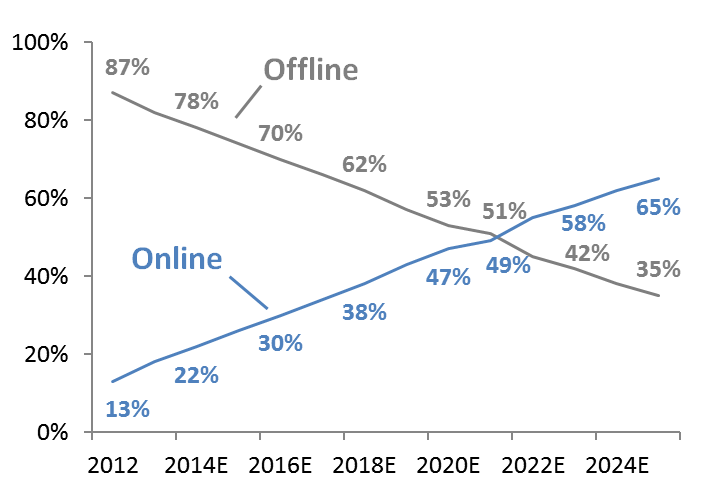 The key takeaway is that we’re in the very early stages of a broad, secular shift to online/mobile ordering. And it is this paradigm shift in the industry that is the driving force behind all the dollars being thrown into the space as investors place their bets on which horse ultimately turns into that proverbial sought-after unicorn. ¹ Data gathered from Thomson, CrunchBase, New York Times, Capital IQ, and Wall Street Research Reports; includes private company capital raises and M&A activity. ² Wall Street Research Reports and Public Company Filings.